In the history of professional construction practices, brick is one of the oldest of all building materials. It is also arguably the most durable, since there are brick walls, foundations, pillars, and road surfaces constructed thousands of years ago that are still intact. Today, bricks are most often used for wall construction, especially as an ornamental outer wall surface. Officially, the term brick is used to denote a building unit made of shaped clay, but in modern times it is used to refer to any stone- or clay-based building unit that is joined with cementitious mortar when used in construction. Typically, bricks are about 4 wide, 8 inches long, with a variety of thicknesses. Larger stone- or clay-based building units of the type used in foundations are usually called blocks. 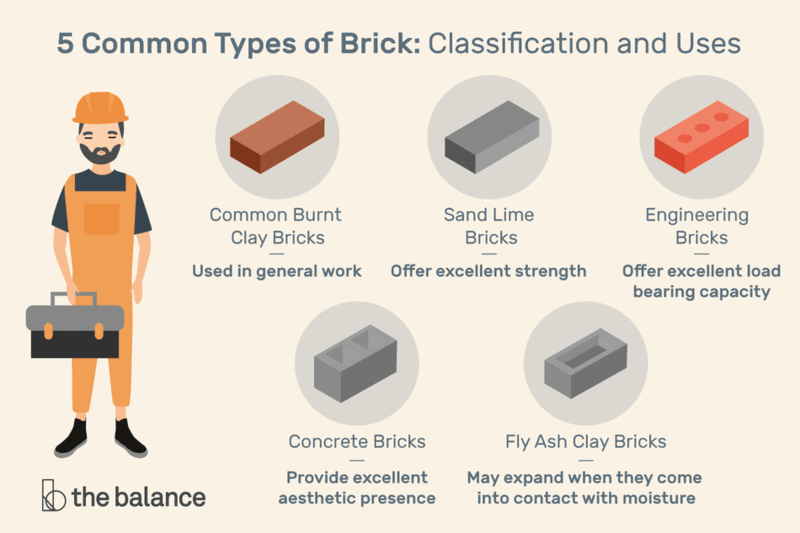 There are a number of ways that brick can be categorized. For example, you can divide brick into the types used for facing (exposed and visible on the exterior of a structure) vs. backing bricks (which are used structurally and are hidden from view). Another means of categorizing brick is according to how they are manufactured: unfired (brick that is air-cured) and fired (brick that is baked in ovens in order to harden it). Bricks can be also categorized according to their typical use: common bricks or engineering bricks. For purposes of residental construction, it is usually common bricks that are of most interest, since engineering bricks are more often used in civil engineering projects, such as road or bridge construction, or in sewers construction. Brick veneers: These bricks are thin and used for surface cladding. Airbricks: These bricks contain large holes to circulate air and lessen weight. They are used in suspended floors and cavity walls. Perforated bricks: These bricks contain many cylindrical holes drilled throughout the brick. They are very light in weight. Bullnose brick: These are bricks molded with round angles. Paving bricks: These bricks contain a good amount of iron. They are used in underfoot paving applications. Capping bricks: These bricks are used to cap the tops of freestanding walls. Hollow bricks: About one-third of the weight of the normal bricks, these are used mostly in partition walls where load-bearing is not required. Burnt clay bricks are the classic form of brick, created by pressing wet clay into molds, then drying and firing them in kilns. This is a very old building material—the type of brick found in many of the ancient structures of the world. In appearance, these bricks are solid blocks of hardened clay, usually reddish in color. Burnt clay bricks are typically sold in four classes, with first-class offering the best quality and most strength. These high-grade burnt clay bricks have no noticeable flaws, but they’re also going to cost more. Their color appearance is gray instead of the regular reddish color. Their shape is uniform and presents a smoother finish that doesn’t require plastering. These bricks offer excellent strength for load-bearing structures. When pigments are added, the bricks can be used for ornamental purposes. Less mortar is required during construction. Edges are straight and precise, making construction easier. Bricks do not effloresce salts and minerals. Concrete bricks are made from solid concrete and are growing in popularity among homeowners. Concrete bricks are usually placed in facades, fences, and provide an excellent aesthetic presence. These bricks can be manufactured to provide different colors if pigments are added during production. Concrete bricks should not be used in below-ground applications. Fly ash clay bricks are manufactured with clay and fly ash—a byproduct of coal burning—fired at about 1,000 degrees C. Because fly ash contains a high volume of calcium oxide, this type of brick is sometimes described as self-cementing, since it expands when exposed to moisture. This tendency to expand, however, can also produce pop-out failure. Fly ash clay brick has the advantage of being lighter in weight than clay or concrete brick. Also known as refractory bricks, these are manufactured from specially formulated earth with a high aluminum oxide content. After burning, these bricks can withstand very high temperatures without their shape, size, or strength being affected. There are many advantages when bricks are used as part of the construction. Aesthetic: Bricks offer natural and a variety of colors, including various textures. Strength: Bricks offer excellent high compressive strength. Porosity: The ability to release and absorb moisture is one of the most important and useful properties of bricks, regulating temperatures and humidity inside structures. Fire protection: When prepared properly, a brick structure can give a fire protection maximum rating of 6 hours. Sound attenuation: The brick sound insulation is normally 45 decibels for a 4.5 inches brick thickness and 50 decibels for a 9-inch thick brick. Insulation: Bricks can exhibit above normal thermal insulation when compared to other building materials. Bricks can help regulate and maintain constant interior temperatures of a structure due to their ability to absorb and slowly release heat. In this way, bricks can produce significant energy savings—more than 30 percent when compared to wood construction. Wear-resistance: A brick is so strong that its composition provides excellent wear resistance when compared to wood.